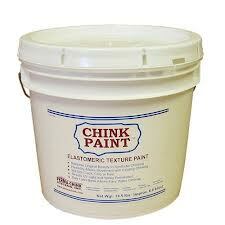 Chink-Paint is an elastomeric, textured coating for renewing or changing the color of chinking. This makes it ideal for giving a facelift to your home by brightening the appearance of old, dirty chinking or altering the color of existing chinking. Chink-Paint’s elasticity enables it to expand and contract with Perma-Chink or Energy Seal without cracking or peeling.